Most of OTC’s students come to the college to gain an education and earn a degree, but Linda Lober is taking classes in order to maintain a connection to her late husband. The 66-year-old Lober is trying to honor her husband’s memory by learning the craft of woodworking so she can complete the projects he had started at their home. Lober is mechanically inclined. During her career, she worked for TWA Airlines as a mechanic who installed equipment on the interior of the planes. But carpentry was new to her, so she enrolled in a woodworking class and several general education courses this fall in order to learn how to use Steve’s machines to make cabinets, bookcases and other wood items. It was the first time Lober had been inside a classroom in 50 years. “I’m just feeling so proud and humble to be able to do this in life,” she said. Besides learning woodworking skills, Lober is talking about her husband’s battle with lung cancer that killed him in 2015, just a month after he walked down the aisle with his daughter at her wedding. His cancer was discovered in 2013 when he went to the doctor to be treated for another illness. An X-ray showed a shadow on his lung that was later diagnosed as cancer. “I went on an emotional roller coaster. Steve never shed a tear. I cried,” she said. At the time of his diagnosis, Steve was given just three-six months to live, but he survived two years, four months and 22 days. He was 65 when Linda and the family said goodbye. Justin Frese, Lober’s instructor, said Lober brings a lot of the classroom. “It is refreshing to have someone in class that has such a clear goal in mind. She wants to become familiar with and competent at using all of the tools in her deceased husband’s woodworking shop. She has this goal so that she can carry on with their retirement plans even if her husband Steve is not here to enjoy retirement with her,” he said. 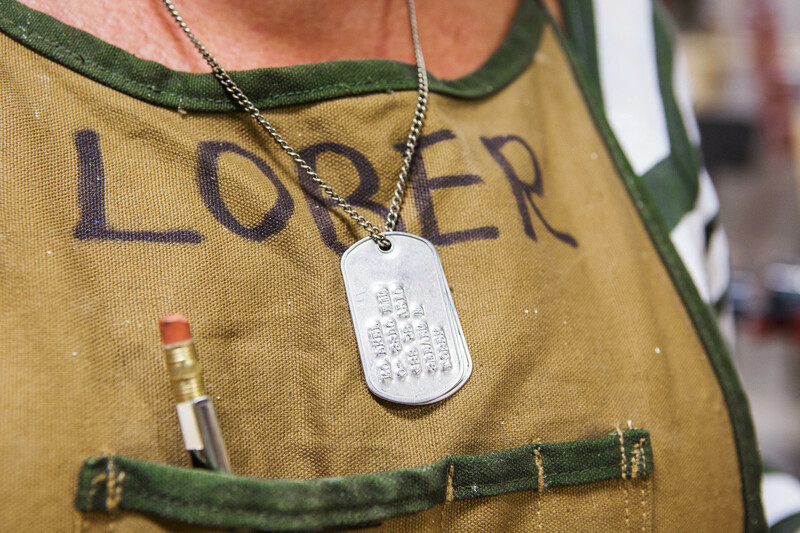 Lober, who wears Steve’s U.S. Army dog tags around her neck and uses his work apron in class, has been working on how to build a wooden box. She wants to make one for her husband’s ashes. In addition, there are cabinet and bookshelf projects for her to complete at home. Besides giving her an education, OTC gives Lober a connection to her husband. “Steve’s projects are going to get done. It’s a mourning process for me. It prevents me from crawling down a rabbit hole,” she said.